The mixture for these appetizer-sized crab balls is similar to a crab cake mixture. Some mayonnaise, a bit of mustard, and Worcestershire sauce add flavor. For extra color, add finely minced green or red bell pepper. Or add some finely chopped green onions to the mixture. Serve these tasty crab balls with a​​ remoulade, tartar sauce, or cocktail sauce. Pick the crab meat over, discarding any bits of shell. Gently combine the crabmeat with the beaten eggs, onion, if using, cracker crumbs, mayonnaise, mustard, and Worcestershire sauce. Add the salt and pepper and gently shape the crabmeat mixture into small balls. Place the crab balls on a large platter or baking pan and chill until firm. Just before serving time, roll the crab balls in fine breadcrumbs and deep fry in hot oil (365 F) until golden brown. Remove with a slotted spoon and drain on a piece of paper towel. Serve hot with your choice of remoulade sauce, a ranch dressing dip, or cocktail sauce. To make them for a meal, shape the mixture into several small or four larger crab cakes and fry or sauté them in butter (with or without the crumb coating). 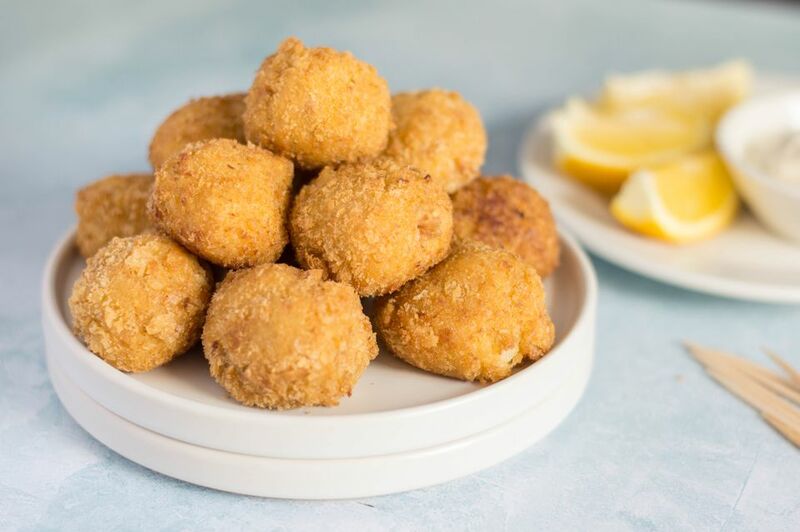 Roll the crab balls in panko crumbs before frying for an extra-crispy coating. Add finely chopped red or green bell pepper to the crab mixture. Add about 1/4 to 1/2 teaspoon of Cajun seasoning to the crab mixture.